The absence of required budget for full implementation. Incomprehension of benefits of the PMO. Busy schedule of staff required for the implementation. The desire to grow the system safely, without haste in order to receive tangible results at each stage of implementation. The desire to check the professionalism of the Contractor’s consultants before you trust them full scope of work. 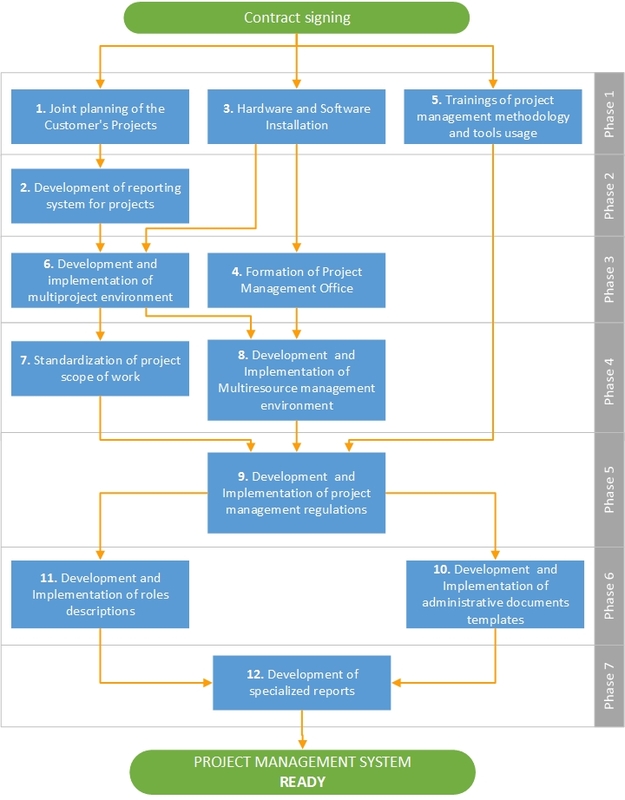 Experts of our company developed a unique complex of works on implementation of Enterprise Project Management (EPM) system, consisting of 12 Deliverables. Each deliverable is generated separately, quickly and is relatively inexpensive. Meanwhile immediately after creation begins to work on the Customer and brings maximum effective results. The Customer may terminate or suspend the implementation at any phase, herewith the created results continue to work. After the implementation of all 12 Deliverables, the Customer receives a complete program-methodological complex for project management – EPM. Joint planning of the Customer’s projects. Development of reporting system for projects. Forming of the Project Management Office. Trainings of project management methodology and tools usage. Development and implementation of multiproject environment. Standardization of project scope of work. Development and Implementation of multiresource management environment. Development and Implementation of project management regulations. Development and implementation of administrative documents templates. Development and implementation of roles descriptions. In detail all the results described below. If necessary, some results can be created in parallel. The general sequence of achievement is represented in the diagram above. To create a financing plan of implementation, taking into account all the company’s financial capabilities. Not tied to a tight deadline, and to suspend the implementation, whenever necessary. Gradually adopt existing approaches to company’s project management, as accepting the results by the company’s employees. Joint planning of the pilot projects of the Customer using Microsoft Project 2013 Professional. Creation of the project schedules and related documents. Audit of the project management processes and tools. The responsible officers of the Customer begin to plan each project from start to finish. Typical project WBS. Can be used as template for future projects. Project graph, which shows delays and outpaces. Lists of key control points (milestones) of the project. There is an ability to keep a record of time, resources and financial costs of projects. Recommendations for changing of the project management processes and tools. Project planning with Microsoft Project 2013 Professional. Working sessions with the specialists of the Customer. Regulatory documents, operating in the company and the industry of the Customer. Contractor’s deliverables for the project management system. This step replaces the classical consultancy “AS IS” analysis of Customer’s business processes. In contrast to this analysis, schedules can be used for the performing project control right after its creation. Based on tracked data we identify and structuring points of interaction between Company organizational units. Clearly defined, documented and attached to the time the responsibility of each of the executors of the project. Development and use of the basic plan provides a canvas for a further tracking projects and a platform for deployment of the project management system.In the charts immediately applied all the technological relationship, which allows them to create dynamic models of project execution, with the help of which you can automatically track changes in the timing of execution of projects. The dynamic model of the project looks like a common WBS and a detailed implementation schedule with those responsible for implementation, management and control points. Provide planners and analysts, as well as tools and best practices for planning pilot projects of the Customer. Starting from the first result, the Customer is strongly encouraged to designate a person responsible for the EPM system. At this step, the Customer is obliged to assign a person responsible for project planning and to provide access to the information necessary for planning. Administrators and/or planners of individual projects should also be assigned. Reporting may be organized after the planning and creating of the project base plan. It is represented with charts that shows forecasts at the end and before the completion of the project. S-curves (visual diagrams of planned and actual progress from 0% to 100% with reference to the date). Pessimistic and optimistic forecasts completion of the project. Indices SPI and CPI, reflecting the dynamics of leading or lagging. Programming scripts for automated reporting. Workshop on harmonization of reporting requirements and the appearance of the reports. For project status tracking we develop visual reporting and implement its generation on regular automatic basis. Reports based on Earned Value Method (EVM) used to determine current and future status of projects. Provide tools and best practices for the development and programming Customer’s reports. Provide reporting requirements for projects. Coordinate and provide comments to the created templates and forms of reporting. Perform testing of the generated reports. Installation and configuration of Microsoft Project Server 2013. The Customer`s access of employees to the system through Project Web Access regardless of where geographically employees are. The installed and configured server hardware and licensed software. Systematization and structuring of data for the execution of projects. A single repository of data on projects. Organization of access control system based on the hierarchy of project participants. Secure access to the system from anywhere in the world via the Internet. Backup and archiving of data. Organizational Breakdown Structure (OBS) throughout the customer’s organization. Is a consequence of the installation and configuration of hardware and software for servers. Setting up the system in order to have access to it from anywhere in the world. Provide system administrators and programmers, as well as tools and best practices for installation and configuration of servers. Assign a responsible system administrator, as well as conduct their own testing system and remote access. Developing of requirements for PMO managers and employees. Joint recruting of new employees for PMO. PMO with qualitative employees based on relevant criteria. Employee responsible for task completion report on the tasks result themselves (Timesheet). Training plan template (in a form of e-mail with a hyperlink to the step-by-step instructions in the system). Microsoft Enterprise Project Management System (EPM). Company’s internal order for trainings performing. Determining the way actual information should be delivered to the EPM system: by employees themselves OR by administrators. Holding training plan in which the system introduced a special schedule of the project and the tasks are sent for all involved employees. Complete tasks associated with the study of the most essential elements, i.e. step-by-step instructions – what to do to complete assigned work plan. After completing the training plan, employees have the knowledge sufficient for the initial use of the system. Planning, execution and monitoring of the projects together with our consultants. Consulting of Customer employees by our experts. Provide experts in planning and consultants. Provide tools and best practices for staff recruitment and training. Creating a report on the results of training (how long it took for each employee, which questions arose, etc.). The publication of the internal order on the training. Perform staff recruiting (internal or external) for PMO based on provided requirements. Ability to manage a separate projects as well as project portfolio. Optimizing the use of company resources. Perfect skills in using EPM system. Training on project management methodology. Training on Microsoft Project 2013 Professional. Training on Microsoft Project Server 2013. Employees of the Customer attend two three trainings. After each of the training, students are tested for mastery of еhe acquired material. Create report on the results of trainings (per each participant). Allocate employee’s time (3 full-time days) to participate in training and testing. 6. Development and implementation of multiproject environment. Created clear hierarchical structure of the entire portfolio. Senior leadership is facilitated by visual inspection of projects. Project workplace at EPM system. The hierarchy of internal and external projects is created and implemented at the EPM system. External are performed for clients of the Customer. Internal are performed to its own organizational and technical development of the company. Provide tools and best practices for designing and programming the hierarchy of projects, relationships and indicators. Approve a hierarchy of projects and develop together with the contractor the criteria for evaluating projects. The type of work and current production rates are determined in the project and organizational activities. Prioritization of information, crucial for the project, and the reduction of unnecessary information. The process of project planning is facilitated for project managers. You can analyze and compare various projects on a standard work packages. The structure of the project (WBS). Work encoding algorithms and best practices. Provide tools and best practices for developing project templates. Provide specialists for templates approval consulting. Managing projects using the entire set of corporate resources. There is an opportunity to view the resource allocation and usage across all projects and manage projects taking into account the limited resources of the company. Hierarchical structure of resources are created (RBS). Created resource allocation reports (allocation over projects, load forecasts, forecasts of demand). The standard resource provision of project works is developed. Reducing downtime resources.Transparency of resource utilization, i.e. the understanding of who is doing what. The replacement of the local resources with the resources from corporate pool. We introduce the term of corporate resource, i.e. all performers and production capacity are introduced into the system in the form of resources. All local resources used in the project are replaced by corporate. Provide tools and best practices for designing and programming the hierarchy of corporate resources, relationships and reports. To approve the hierarchy of resources and develop the criteria for evaluating resources together with the contractor. The package of procedural documentation for the organization processes of project management. The package of regulatory documents, including provision for regulations and procedures for the project life-cycle. Functions, duties and responsibilities are separated between employees. A clear list of activities and project management processes is defined. Increased manageability and control of the EPM system and change management system. Development of documentation in order to organize project management processes. Documentation goes through conditional improvement in real projects. Basically, some pilot projects are used in order to find gaps in documentation and improve it. Provide analysts and consultants, as well as tools and best practices for the documentation development. Provide employees that are able carefully to subtract regulations for compliance specifics of the company and approve documents regulation. The package with templates of administrative documents in electronic form on the EPM server. Actual administrative documents which Company uses at that moment. Employees do not like to document the results of their work because of the great complexity of creating documents. And even if the operating instructions in the employee’s duties include the release of certain documents, they are available only when you have free time, or pressure from management. On the other hand the documentation is necessary to establish the current status of the project, decisions and formal agreement (signature) between parties that are involved in the project. To resolve this conflict we will develop templates for all major administrative documents that will allow you to reduce the complexity of creating documents, to unify workflow and provide a common understanding of the produced documentation.After the release of the templates work for their completion are included in the schedule of the project template that provides almost 100% probability of documentation at all stages of the project. All identified administrative documents issued in the form of Microsoft Office templates with embedded comments and tips for filling the face. Next filling of patterns will be done on real projects, and then edits will be made to the templates. Provide analysts and consultants, as well as the tools and experience to develop and design templates. Provide employees that are able to study the patterns on their conformity to the specifics of the company. Developing of the package of the instructions for every project role. Responsibility assignment matrix (RACI matrix). Head of PMO role description. Other relevant role-based description of project participants. Development of role or variation of job descriptions for all project participants. Provide analysts and consultants, as well as tools and best practices for design and development of role/job descriptions. Provide employees which are able to carefully examine the role/job descriptions for compliance with the specifics of the company. Package of specialized reports, ensuring the needs and characteristics of the customer’s business. Programming automated reporting on EPM system. To provide analysts and programmers, as well as tools and best practices for the development and programming of specialized reports. To provide requirements for specialized reports.